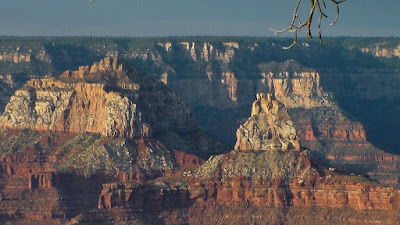 We booked a room at the Xanterra Parks and Resort on the South Rim of the Grand Canyon. It’s a very convenient place, only about a mile from Grand Canyon’s South Rim. Beautiful alpine scenery all around, great for walks. Also, the free shuttle service which runs all over the area is very efficient and regular too, making it all a very accessible and enjoyable place to visit. The twin room which we stayed at was clean and appropriate, and the great condition of the bathroom was a definite plus too. The elevation is nearly 7,000 feet, but the temperature is typically 25 degrees cooler than the desert. There is a free bus service within the South Rim Area. The shuttle took us all around the canyon. First, we went to the Desert View Information Center, whose staff told us how the Grand Canyon continues to inspire a variety of people. It is located at the park’s east entrance, 26 miles from Grand Canyon Village on hwy. 64. at Market Plaza. We were also at the Verkamp’s Visitor Center, located within the Historic District on the canyon rim just east of the Hopi House, which is one of the oldest buildings in the park. The National Park Service rangers and Grand Canyon Association staff will answer any questions you may have regarding the park and its natural and cultural resources. The hours vary seasonally; check the current schedule at the park. 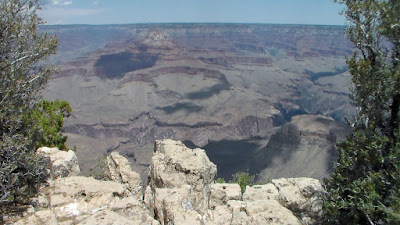 Any visitor can plan to visit the Grand Canyon Visitor Center and see a park film and view exhibits. This Visitor Center is located near Mather Point and is within walking distance to the canyon rim. Ample parking is available and you can ride the free shuttle bus from any of the in-park lodges. We also visited the Tusayan Museum and Ruin to see original artifacts, which included split twig figurines and ancestral Puebloan pottery. And the Yavapai Geology Museum is a unique historic building located just a short walk or shuttle ride from the Grand Canyon Visitor Center. It features gorgeous canyon views from its panoramic windows. Exhibits help park visitors to see and understand the complex geologic history of the area. Finally, there is a General Store located at the Grand Canyon Village Market (928-638-2262) that carries a full line of groceries as well as hiking equipment. A tourist can purchase anything he needs and also buy gifts at this General Store. Dirk Vermin aka The Energizer Bunny!